I Thought I would make a thread for sharing info about the Osram 488nm single mode 60mw diode and other diodes like it when you find them. These appear to have static protection and a feedback sensor. Although prices had started sky high for the medical and scientific industry they no doubt will come way down in time and we may be about to see it break as I believe the bell shaped curve of buyers are at a lower price point and most of all Sharp as well as others ( N ) are offering competition. I'd go in for a group buy for a few. With the sharp 488s coming I'm not sure I want to spend a lot on these diodes. Sharp has better specs than the osram diodes, thats for sure. Ouch, I didn't know so high. I agree, wait. I was thinking about asking for a quote. Quotes are free but at even 1/3 the price, i'd rather wait to buy one of the others. I knew the Osram diodes were pretty expensive and Sharp has been working to bring a low priced one. Hopefully that will happen soon. I'd hate myself for paying even $100.00 for the Osram, only to see the Sharp come out in the next few months. I agree, I can and often do wait rather than pay a " gotta have it now " inflated price, I'm just looking to share and gather information about what is and what's going to be available and affordable. 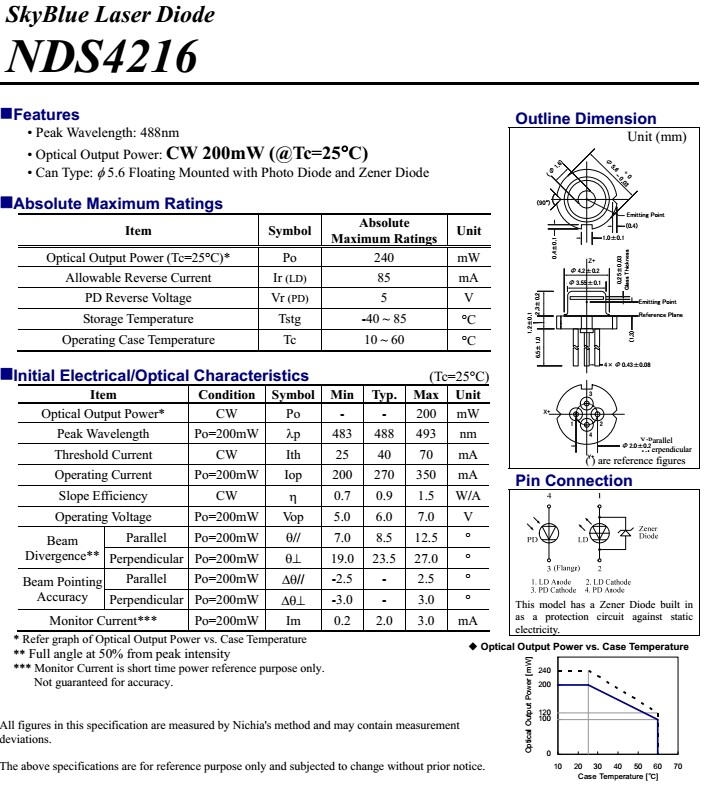 Thanks for posting the spec sheets from Osram and Nichi@. I did like comparing the two for wavelength, power and divergence. Sharp 488nm - Soon to come?? Nowhere better to add a 488 pic!